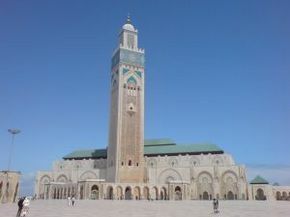 Marrakech, Casablanca, Fes and Tangier are the first things that one can think about when we speak about Morocco. These towns are tourist hot spots for any traveler and will offer the clear waters of the Mediterranean, white hot sands of Sahara, green valleys full of life, the magic color, and the spicy smell of the medina. Due to its location in Northern Africa, the coast of the Kingdom of Morocco with its capital city at Rabat has a unique warm Mediterranean climate. As we head toward south the climate becomes hotter and drier due to the presence of the Sahara Desert and only the peaks of the Atlas Mountains have a cooler climate. The Atlas Mountains are the highest (Mt. Jebel Toukbal 4165m) and are partially covered by snow almost the entire year. Also representative for the Moroccan geography are the oasis found on the river valleys oriented towards the Sahara Desert. The best time to travel here from a climatic point of view are the early summer days when rain is not a threat, temperatures during the day are warm and cooler during the night. The present territory of Morocco has been initially inhabited by Berbers, later conquered by the Roman Empire, Arabs, Spain, and Portugal. All of these intruding civilizations have left their marks in specific areas of the country. Flora and fauna here is characteristic for each type of landscape, therefore cork oaks are found on the Mediterranean and Atlantic coast, many species of evergreen trees like pine and cedar grow in the Atlas mountains, fruit trees and almond trees grow in the valleys and the oasis are represented by tall palm trees and different species of cactus. With such generous nature, fauna is also well represented by carnivores like panthers and jackals, herbivorous like gazelles, many species of birds among which the spectacular pink flamingos and different species of fish and marine animals like the monk seal form the Dakhla Bay. If you are from the European Union, Switzerland or Canada, you do not need a visa to enter Morocco but you must have a valid passport and must not stay more than 90 days. The currency in Morocco is the Dirham and cannot be converted outside the country. In matters of accommodation Morocco offers many options whether you choose to visit a medina, the Mediterranean or Atlantic coast, an oasis in the desert or the peaks of the Atlas Mountains. From this point of view Morocco is reachable by all three main transport options; by air, sea, or land. The main international airports are in Casablanca, Tangier and Agadir, working with all main international airlines offering regular and charter flights. You can also travel by sea contacting one of the many ferry service companies especially if you are from one of the Mediterranean shore countries. By land you can choose from the many travel agencies offers including bus or train tickets form the first port you reach in Morocco to your final destination. Whether you want a relaxing holiday on one of the sandy beaches, in a colorful and full of history medina, in a remote oasis surrounded by orange color sand dunes or somewhere in the mountains, Morocco is ready to accommodate you and offer you all the comfort you need. You ca go for a family vacation in a luxurious resort or closer to nature in a bungalow or camping, no matter the option, you will have the holiday you always dreamed of. A holiday in Morocco may be a travel back in time; the landscape will help you imagine the famous camel caravans, the medinas with their narrow and intricate streets, the souks full of color and noise, all these things are the magic ingredients for a perfect vacation. Resorts are mainly located towards the coast line; some of them are in the medina like Marrakech where Hotel Ryad Puchka offers a traditional building in order to better feel the Moroccan atmosphere with large and beautifully decorated rooms, interior garden, and traditional cuisine. All these locations seem a piece of heaven after returning from an exhausting running around markets and souks. Hotel Riad Souiri is a perfect retreat for the ones willing to spend their holiday near the crystal clear waters of the ocean. Perfect for families, the hotel is at 10 minutes distance from the beach and 20 from Essouira, the nearest town also known as the “Pearl of the Atlantic”. It is the best combination between the town full of history and traditions and the attractive and very offering Atlantic Ocean beaches. The main attractions for tourists are the camel excursions in the desert, windsurfing, going to a hammam which is a traditional bath house and bird watching, all of them unique experiences you should not miss. The Moroccan cuisine is a mixture of Arab, African, Mediterranean and Berber influences due to the country’s multiculturalism. The most famous Moroccan dish is the cous cous, and the most important ingredients of other traditional dishes are lamb and beef meat together with poultry and fish. Spices play a very important role; the most common are saffron, mint, cinnamon, ginger, coriander and many more. Other types of commonly known dishes are the saffron rice, pickled lemons, tajine which is a combination of lamb, fruit, and spices, harira soup which is a traditional lentil soup and many more strongly sweetened desserts, Arabic coffee, and mint tea. With such a privileged location trapped between the Mediterranean Sea, Atlantic Ocean and Sahara Desert, Morocco is a destination where one may have the impression of a never ending open space. A land of glittering sand dunes, interminable beaches and sky high mountains, Morocco welcomes tourists from all around the world with their famous hospitality.